This is one of Gary Patterson's well known images. 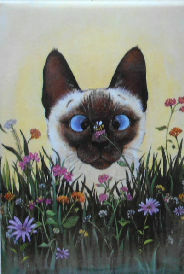 A Siamese cat is out smelling the flowers and a bee lands on its nose (sometimes how life goes for us also). The magnet is 2" wide x 3" high. Previously owned but in good condition.